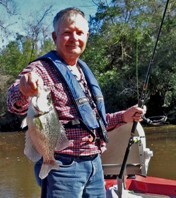 LITTLE LAKE HOUSTON CRAPPIE CAUGHT TODAY - Lake Houston Fishing! Last edited by butz on Thu May 31, 2018 5:17 pm, edited 2 times in total. You tryin to sell it??? nice crappie for this time of the year a late spawner. Those are fattie for sure!! And one of each to boot. Did ya weigh it... looks like 2 and aahh half to me..
Well is this a guessing game on how much it weighed? 2+? was it 2.01lbs or was it 2.99lbs or in between?